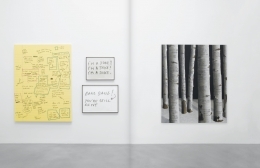 Sean Landers was published on the occasion of the artist’s fourth solo show at the gallery, and his first at the uptown location (35 E 67th Street: March 1st – April 23rd, 2018), as well the simultaneous premiere of a new suite of Landers’ tree paintings at the ADAA’s The Art Show, at the Park Avenue Armory (Booth C10: February 27th – March 4th, 2018). 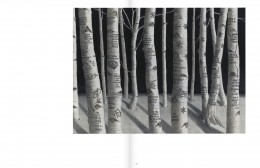 The publication brings together three distinct bodies of Landers' recent work in beautifully reproduced images: yellow legal pad paintings, text drawings, and the Aspen tree paintings. 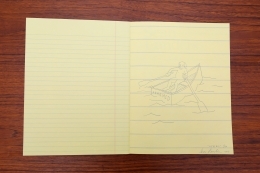 Since 1990, a ubiquitous pad of yellow legal paper has been the unwitting means through which Landers commenced his artistic career. 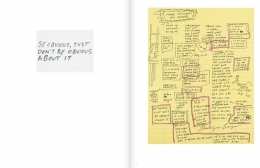 His constant companion throughout those early days, the yellow pages were the vehicle for his art production—texts scrawled in ballpoint pen documented the details of his life from the banal to the painfully personal. 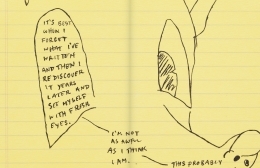 Flash forward 28 years and the yellow legal pad is still close at hand, each page offering a glimpse into Landers’ artistic process. 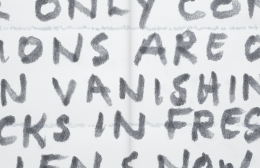 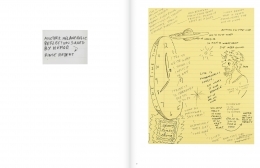 The artist gradually recognized that these works “bear an aesthetic of no aesthetic” and began to use the pages to create his new series of yellow legal pad paintings. 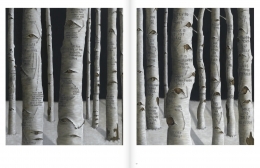 These paintings serve to not only illuminate their own existence, but also the existence of a number of paintings in another body of work—the Aspen tree paintings. 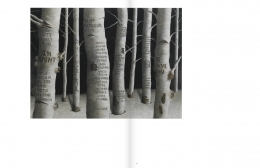 The attentive reader can literally see the marriage of the writing-side of Landers with his painting-side, by cross-referencing the texts and drawings in the yellow legal pad paintings, with those “carved” into the bark of the Aspen tree paintings. 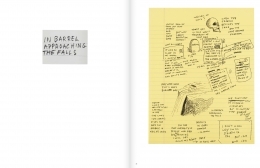 A limited number of signed special editions are also available, featuring a cartoon individually hand drawn by the artist onto the book’s endpaper. 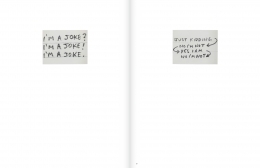 Entitled “We’re All” these individually hand-drawn editions feature on the book’s endpaper, Landers’s “man-dog” character at the oars of a rowing boat, whose transom has been given a unique adjectival label. 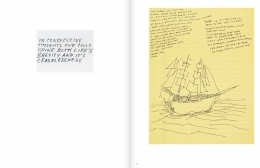 Copies of both editions are available for purchase in our bookstore at 456 W 18th Street.